THE CRESCENT SPY (Lake Union Pub.) is the latest novel by Michael Wallace. It’s a historical book set during the Civil War when the Union and Confederate Armies are fighting. Writing under a man’s name, Josephine Breaux is the finest reporter at Washington’s Morning Clarion. Using her wit and charm, she never fails to get the scoop on the latest Union and Confederate activities. But when a rival paper reveals her true identity, accusations of treason fly. Despite her claims of loyalty to the Union, she’s arrested as a spy and traitor. President Abraham Lincoln is one of my favorite presidents and I’ve done a fair amount of reading about him and his Presidency over the years. I found the premise for THE CRESCENT SPY interesting, but personally, I didn’t fully sign on. I found Josephine to be a smart fully developed character with a lot of sass and courage, but unfortunately, I found myself overwhelmed with back story. In Michael Wallace’s personal bio, it writes he grew up “in a small religious community in Utah, eventually heading east to live in Rhode Island and Vermont.” That certainly captured my interest. Thanks to BookSparks http://www.GoBookSparks.com for including Thoughts on This ‘N That Blog on their FALL READING CHALLENGE 2015 #FRC2015 #bookshelfie BLOG Tours. 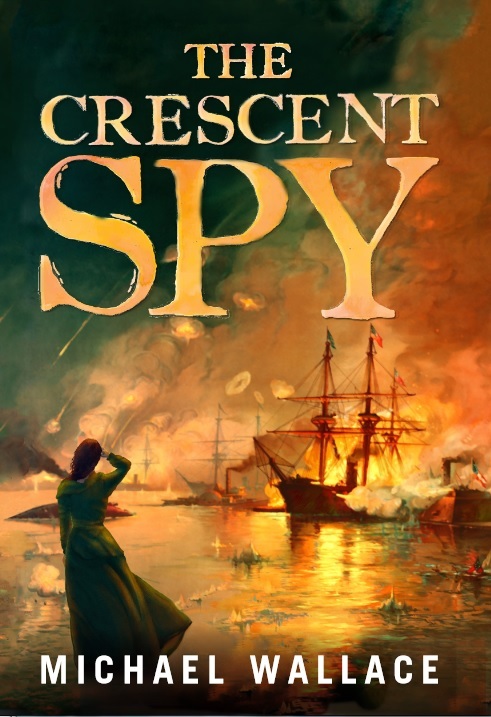 We have one copy of THE CRESCENT SPY to give away. Just leave your name in the comments area and we’ll pick a winner Monday. Good luck and have a great weekend!